Don’t buy a shed if you don’t have stuff. We promise we’re not trying to be smart with you, but seriously... everyone has stuff! Your stuff might just be holiday decorations you dig out of your closet every year or the hobby supplies you try to hide every time you have guests. Everyone has stuff and many times it can quickly move from something you enjoy to something that annoys. Now, if you don’t have stuff always in your way. If everything you own has a place. If you aren’t hurting for space for the things you can’t part with; then, no, there’s no reason to get a shed. From our experience though, this is a very small fraction of the population. The good news is that there is a variety of sizes and styles to fit any storage need you have. Don’t buy a shed if you have a small yard with less than an 8’ opening into your backyard. If this is all the land you have, you don’t want to fill it up with a shed! Enjoy the little bit of green space you have. You might look into adding a storage bench instead. Plus, if you want a shed, understand that for a Cook shed to be delivered, our delivery equipment needs at least 2 feet wider than the shed to maneuver your shed into the right position. 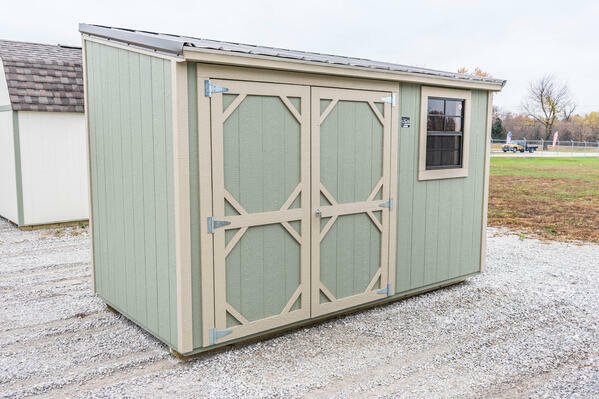 The smallest shed we offer is our 6’x12’ Slim Shed. As long as you have an 8’ wide gate (if fenced-in), we can deliver this shed with no problems! Don’t buy a shed if you prefer to drive across town to your indoor, air-conditioned storage unit. Granted the air conditioning and heating is nice. But, you’ll never own your storage unit. And, it’s across town, instead of where you need it, when you need it. 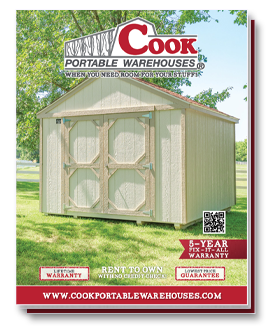 With Cook’s rent to own program, you’ll be able to rent your shed and quickly own it, all while it’s conveniently located in your backyard. Plus, once you own it, you can add electricity and that much desired air conditioner if you want. Don’t buy a shed if you don’t want to improve the value of your home. Some say by improving your landscape you could increase the value of your home by 20%. A storage shed, when properly designed and built, can be an asset to your property. Read more about how to improve your backyard landscape. 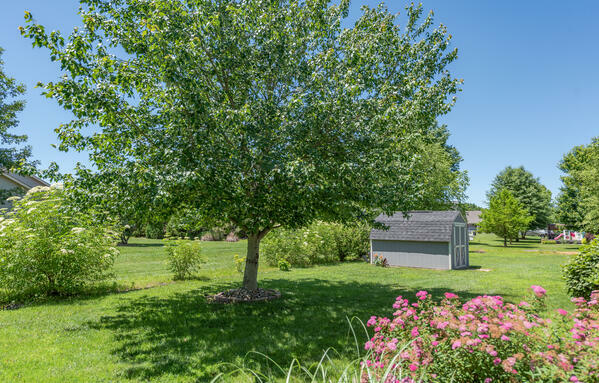 So, you’ll enjoy the shed today, but it’s an investment that future buyers will love too. Don’t buy a shed if you don’t want to make your spouse a little happier. Have you heard any of these phrases around your home lately? Most likely your spouse is just as tired as you are of not having enough space. You could free up space in the spare bedroom, the hall closet, maybe even your garage with a storage shed. Plus, with a Cook shed, you have endless options. It’s your blank canvas. You can create a workshop, a yoga studio, a hobby space, a garden shed, and more! A portable building has seen many uses, but the important thing is that it meets your needs. That’s what we help our customers do at Cook. We help them find room for their stuff. 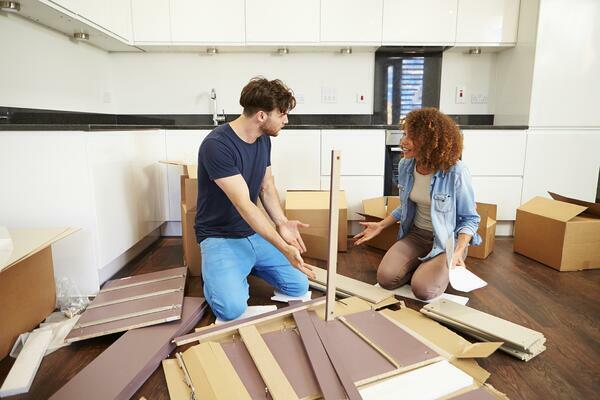 So, if you have stuff and you need more room, let us help you!